What did I remember most about the Regional Filipino Celebration dinner at the James Beard House? Apart from the wonderful food and wine pairings - certainly some of the best I have had - it’s the stories behind each dish that stick with me, and how each of the chefs and their teams have interpreted the tastes and recollections of their distinct Filipino-American experiences across the United States. Truly a collaborative work! Chef Lou Boquila’s Escabeche and Kinilaw are straight from his restaurant, Perla, in Philadelphia. I unfortunately missed the Kinilaw as the hors d’oeuvres circulated, but let me leave this photo of his Escabeche - a Spanish octopus so buttery and tender that my knife slid through just as soon as it broke the light, crisp batter that coated it. 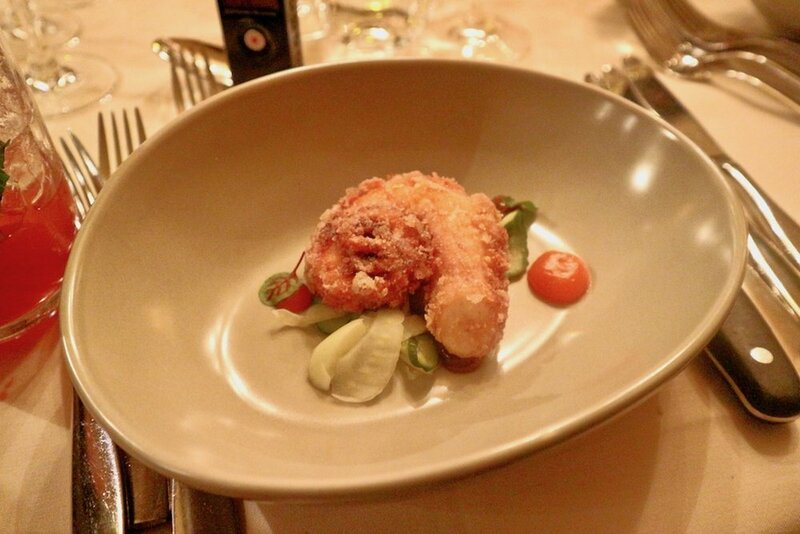 I do love eating octopus, and this particular dish is one its best forms! Plated with pickled vegetables called atchara and a red pepper gel that balances sweet and tart just right (made with sugar cane vinegar and palm sugar) - I savoured every bit and immediately wanted to fly to Philly for more. I had the pleasure of joining Chef Melissa Miranda and her crew for dinner the night after, but here in Greenwich Village I first sampled her Paella Negra and Sarciado - incredibly well-executed takes on Filipino food inspired by the bounty of the Pacific Northwest. Paella Negra were rice balls made with an heirloom variety of purple mountain rice from Luzon province - an ingredient that, even in the Philippines, has to constantly search for its audience in order to encourage local families to replant the grains handed down to them. Like wild rice from the Canadian prairies, these have an earthy, nutty bite to them, they're held together with chopped squid and further tinted a lovely dark hue with squid ink, served with housemade banana ketchup. The Sarciado paired with a crisp Argentian Bueyes Rose de Malbec was the finest Filipino food and wine pairing I have ever had. No less to be expected from a dinner at the James Beard House! Sarciado was fried Skuna Bay salmon, skin-on, with a light egg-based sauce garnished with cherry tomatoes and threads of scallions. A plate of refined presentation with down-home flavour. “Ang sarap!” I couldn’t help but gush to the person sitting next to me; she turned out to be Melissa’s mom. I later asked what her specialties at home were, and she excitedly talked about making rellenong bangus (a fried, stuffed milkfish) while her husband made sarciado. Little wonder that Melissa’s pop-up series in Seattle, Musang, describes itself as “reliving childhood memories of Filipino food”. Chef Miguel Trinidad is no stranger to Filipino food in New York City, helming the kitchen at Jeepney and Maharlika restaurants in Manhattan with owner Nicole Ponseca. His version of Pancit Isabella was delicious - that rich beef broth poured tableside atop alkaline noodles with just the right bite, fantastic! Transports you right back to the Philippines, where he and Nicole have been doing culinary research for an upcoming book. Topped with quail eggs, chicharron, scallions and other savoury garnishes. Unfortunately, I again missed his hors d’oeuvres called Itlog of salted eggs with sabanon, caviar and shrimp, but hopefully I get to sample some version of it on a future trip to NYC. Chef Carlo Lamagna is in the midst of prepping to open his restaurant in Portland, called Magna, for spring 2018. His Rellenong Tahong was an appetizer I just wanted to keep having…and had little shame in licking my fingers for. They were garlicky longganisa stuffed mussels topped with more pickled garlic, encrusted with a coarse crumb topping with sharp hints cheddar - a spot on rendition of a very popular pulutan (bar snack) that is always present at any place that calls themselves a “bar & grill” in the Philippines. Having lived in there until he was in college, I imagine this was one of Carlo’s favourites! His main course, Dinardaraan, is pork collar served with a blood sauce, savoury suman (rice cake), pig’s ear chicharron and pickled onions and mustard greens. Paired with a red Chilean Tempranillo, this was definitely tasty drinking food, ELEVATED. I was beyond excited to finally meet Chef Francis Ang of Pinoy Heritage, who I first chatted with early last year for my podcast Exploring Filipino Kitchens. His Wagyu Beef Tartare, sourced from Idaho’s Snake River Farms, is now the standard from which I will judge all the beef tartare I will have the pleasure of sampling. I doubt any will come close to this distinctly Filipino take with palapa (a condiment of charred coconut, chilies, ginger and spices from the Maguindanao province) and Philippine fish sauce spiked with our national lime, calamansi. Outright fabulous. His dessert, Tinagtag, was a beautifully plated fritter served with passionfruit, persimmons and parsnip. This was the most intricately composed Filipino dessert I’ve had, period. Made with a batter spun into thin threads and shaped into a hollow log, it’s inspired by a traditional snack in the Southern Philippines. Francis’ extensive training as a pastry chef really shines here – and following a number of other Filipino pastry chefs online (many whom I went to school with) I honestly can't wait to see more of these interpretations carry the soul of the place they’re from. Oh, and we also had some excellent cocktails made with Philippine rum. I happily indulged (in a few glasses of) the Jeepney from Kevin Diedrich of San Francisco's Pacific Cocktail Haven, mixed with Tanduay rum, calamansi, honey and sparkling wine. Tim Walters' Sumatra Kula was another tasty bevvy that I could not get enough of. What a way to start the year. My heartfelt thanks to Joanne Boston of JBKollaborations for extending an invitation to visit NYC for this event - her team certainly set quite the bar!